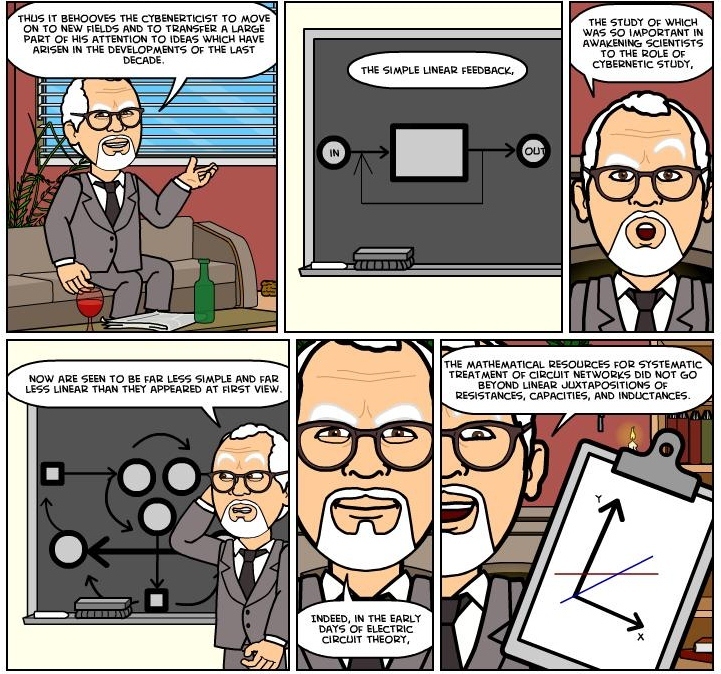 This episode of the Cybernetics Comic discusses how cybernetics changed focus over the years. Norbert Wiener acknowledges a shift from simple linear feedback systems of the first wave cybernetics to more complex feedback systems of the second wave cybernetics. Wiener wrote this Preface to Cybernetics around – what now can be considered – the birth of the second wave cybernetics. The second wave cybernetics (generally associated with the works of Humberto Maturana & Francisco Varela) transformed our image of systems as being stable and homeostatic to an image of interactive wholes. In other words, the coupling between systems and the system<-> the environment.